One of my first pieces ever picked up for syndication was called "I'm Not a Crafty Mom, and that's OK". That was four years ago, and in those four years, I'm finding that I'm still not a terribly crafty (or artistic) mom, but I somehow produced kids with a great desire for visual art and plenty of crafts. We've tried a few art programs in our homeschool, but none have really stuck so far. We don't use the computer often, so online lessons aren't a long term solution we'll stick with, and if it requires a lot of prep from me, it's probably not happening for long before I flame out. The girls have both taken artsy classes in our co-op and I send them to both day long and week long art camps at a local studio, and I will buy plenty of supplies at craft stores, but I can admit that this is not the art education they deserve. 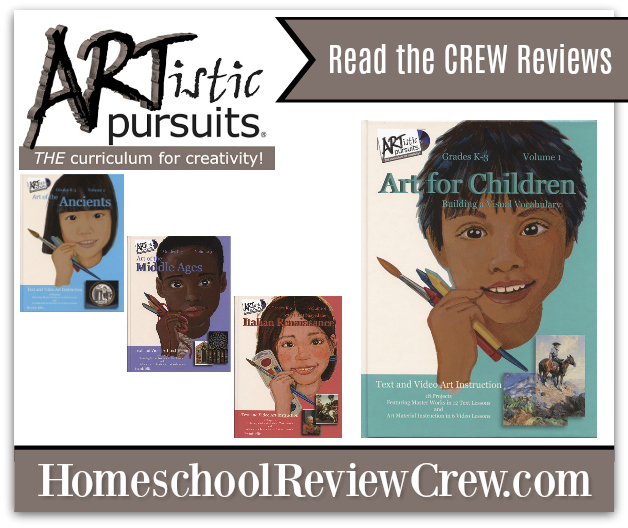 After a few weeks of doing this review, both girls beg to do art lessons with the Art for Children, Building a Visual Vocabulary, part of the ARTistic Pursuits Art Instruction Books with DVD and Blu-Ray from ARTistic Pursuits Inc. The series is for kindergarten to grade 3, and we chose the first volume, I like starting at the beginning, although theoretically you could start with any of the volumes. 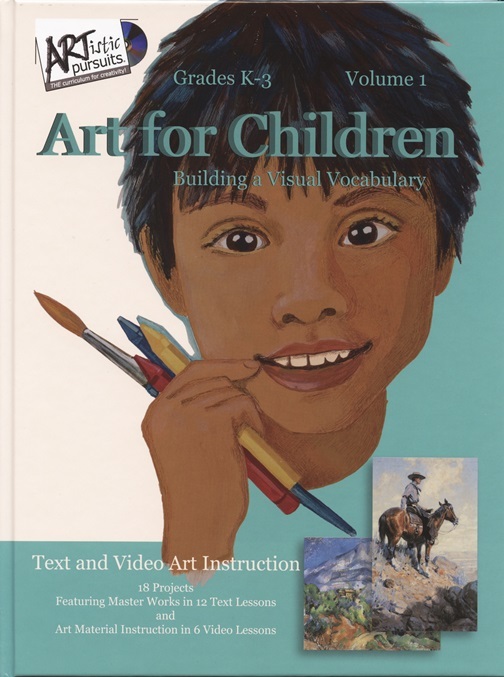 Volume 1 is called Art for Children, Building a Visual Vocabulary, and it features 18 lessons, including 6 video lessons. There are currently six volumes with plans to expand the series to eight total (four years of art education!) Ideally, you'd do one lesson a week, getting through two books a year. Personally, as someone with a two kids two grades apart, I liked that I could very easily use this with both girls at once, without feeling like I was going over my kindergartner's head or talking down to my second grader. They can both do the lessons on their own level. First of all, I love that there is not only a list of materials for the entire book start to finish (so much better than at the beginning of each lesson, causing last minute homeschool moms to panic during breakfast), but there is a picture of these supplies. I cannot tell you how helpful it is to see that. Watercolor crayons totally threw me at first, so it was nice to have a recommended brand. I gathered supplies for each girl and created an "art class box" that we used ONLY for art lessons, so we didn't find ourselves searching for oil pastels or watercolor paper, only to discover that they had been used up. Honestly, I love curriculum that really gets parents prepared to start right and be successful. You can actually order the starter pack straight from the website to ensure you have exactly what you need. Since we already owned some supplies, and I'm pretty good with coupons and discounts and comparing prices, I was able to get two complete sets on my own for less, but if you aren't close to a craft store, it a nice option. In fact, you can bundle each book with a supply kit, ensuring that you are ready to go right from the start. Each lesson in the hardcover textbook includes some introductory and prep advice for the parent, a concept introduction to read aloud, a full color example of art that is relevant the lesson, along with a short history and questions to ask, directions for the actual hands on work, and images to follow. As the parent, I was guiding them along, using the prep notes and book, but I found that I was most useful to them when I did the lessons with them. Remember, I'm not crafty - so I was trying to figure things out too. We liked using the DVD together and experimenting with new things like blending watercolor crayons. Madison's favorite toy - her dollhouse. Now, I know I said I kept the supplies contained for art time only, and I did hold to that. But one of the biggest lesson was observing and drawing the world around them, using the techniques in the lessons. So I got them both "official" artist sketchbooks. With our every day crayons/colored pencils/markers/gel pens/pencils/whatever was handy, they did both draw quite a bit and put their observational skills to use in the sketch books. Reagan is still in the stage where she gets frustrated when things don't look quite right, but Madison filled an entire book in two weeks. They draw and create in notebooks and on scrap paper often, but these sketchbooks had them really thinking about art as a curricular subject to be practiced - like music. Overall, I am planning to go through the rest of the book in our new school year, trying to keep the pace with one new lesson a week. I'm not sure if we'll do the rest of the volumes in order, but we'll keep things going!